The large conservation areas and green belts amongst fields and orchards serve as a feeder area for fauna and flora. We wish to responsibly utilise the environment in which we work by applying resources in a conservational and sustainable way. We wish to manage nature sustainably and to conserve the diversity of our natural and cultural heritage and in doing so, encourage symbiosis. (See Natuurboerdery®). Conservation areas have been created at ZZ2 to preserve biodiversity. Independent experts carry out environmental analyses from time to time to ensure minimal environmental impact. Streams, dams and green belts are maintained amongst fields and road shoulders as ecological havens for indigenous fauna and flora. Ecological services are provided for Natuurboerdery® such as natural enemies against pests, pollinators and wind breaks. Intruder plants are actively eradicted in these natural areas. 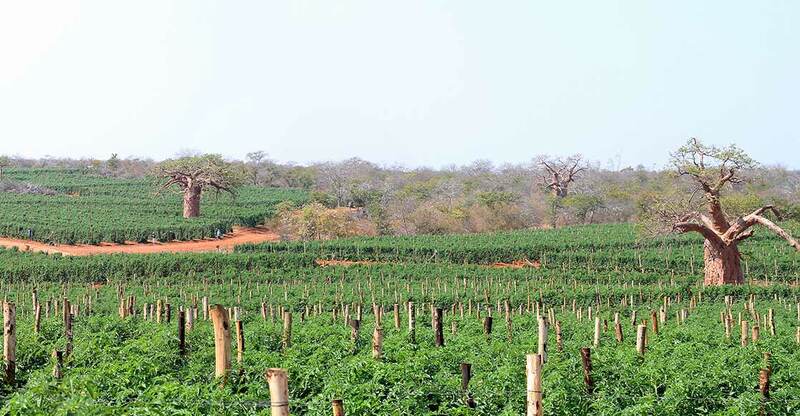 The concept of Natuurboerdery® is also applied here. We follow an ecological view on farming and consider it essential to create areas where the original inhabitants are conserved and ecologically managed. ZZ2 as a farming enterprise benefits from these initiatives. Many birds (including raptors) have returned to these areas. It feels good to work for a company that does not just take from mother earth, but that works hard to plough back and preserve our environment. At Cordier 30 km of the fence borders on the tomato fields and the ecological benefit in terms of insect control is obvious. In this conservation area in the Mooketsi region, we are busy controlling bush densification. The project involves taking out invader bush species with the help of the local community who then sells the wood for kindling. Other ecological control measures include a fire programme and the re-introduction of wildlife. The three conservancies on the Highveld, Munnik, Bloemtuin and Wilgebosch are managed in partnership with local communities. All three conservancies are considered water catchment areas and do not support agricultural activities. Lodges have been established on two of the conservancies.